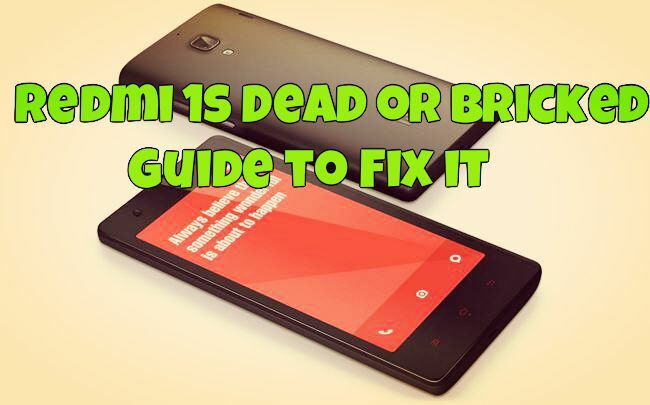 If you recently bought the Xiaomi Redmi 1s and due to some reasons your phone is dead or bricked and don’t know how to solve this problem and how to start the Redmi 1s again from dead state. Don’t worry here is the 100% working guide which you can follow on you phone and keep it alive. There are so many reason when you device is bricked like updating the ROM, installing the recovery or by mistake deleted some system files. One your phone is dead it will not boot and you can install the ROM form the update method. So to solve this issue you nee to use the fastboot method and install the Full MIUI ROM on your device. Few day we posted the same article for the Xiaomi Mi3 and Mi 4 users and this guide is also same but in this you have to use the Fastboot ROM Files for Redmi 1S WCDMA. So without wasting the time lets take a look how to flash the FULL rom on Redmi 1s with Mi Flash Tool. To get started you need a windows PC, MI Flash Tool to flash the Full ROM package and the Redmi 1s ROM zip file. Once you have all these you can unbrick you phone easily. The guide is pretty simple and take a few minutes to complete the task. Step 1. Download the MI Flash tool here and install the same on your windows desktop. Step 2. Download the Full Fastboot MIUI Rom for Redmi 1S WCDMA here and save the file on your desktop. Once you have these files, read the rest of guide here and follow the step between 3 to 9. Once the ROM is flashed on your device your phone will reboot and now running on the MIUI. If you have any questions, please do not hesitate to contact us, leave the comments below. @Vijay… You booted your device in Fastboot mode, that the reason your phone stuck in that screen. Press On/Off button hard and you mobile will went off and again on it. Hi, I had accidentally deleted the ‘AntHalService.apk and AntHalService.odex’ files in my RedMi 1S. Now phone is showing loading launcher and I cant use the mobile. So flashing to other roms will help? Hi Sidharth, Does it work for erased IMEI as well? I have read in many forums that it is necessary to backup EFS folder before trying out custom ROMs (prevention is better than cure 🙂 ). I am just not able to find an option to back up efs for Redmi 1s. I was trying using TWRP v2.8.0.1. @Gyan…. Have you flashed the Fastboot rom or not. If yes thn the first boot will take some time. sir now its not flashing and an Unspecified error(0xffffff01) is coming ..
@Gyan…. No Problem…. Read this guide very carefully https://www.technobuzz.net/flash-miui-bricked-mi-3-mi-4-fastboot-mode/ And Flash the ROM. And Try putting the folder of you Redmi 1s Fastboot rom in the root drive like C:/ D:/ Not in the any folder. sir i’ve put the file in C drive and tried this 3-6 times and unspecified error is coming every time , i was thinking that may be i’ve downloaded the wrong Rom may be you should suggest me the correct option . I’ve downloaded “JHCCNBF36.0?4.3? 608M	” this rom from the site is that ok ? I’ve accidentely wipped all data and now i’ve got this boot loading screen ……..
@Gyan THe ROM file you downloaded is the correct one. [00000F6C]aaefb212	0.03	operable program or batch file. In my Mi3 i also face the same probe. Thn i followed these steps. Put the rom file in C:/ and uses the flash_all.bat option in Advanced > fastboot script option and the problem is solved. plzz sir suggest me any other option so i could recover my phone ?? My Redmi 1s gets automatically reboot every 5 min what to do? and now i guess my phone is dead..
help me out what to do. is it in chines or english? i need boot file for mi 1s . in umt dongle my deive doesnt boot . boot failed.